How much do you know about strokes? Most people are not well informed in what a stroke is and how they happen because it’s not important at the time. But, it is. I thought strokes happen to older people, so I didn’t need to worry. May is the perfect time to learn about strokes. When someone has a stroke, everyone around that person is affected. Spouses, family and friends are overwhelmed when a trauma happens, so be prepared. I also want to share what we found helpful, including ongoing encouragement. 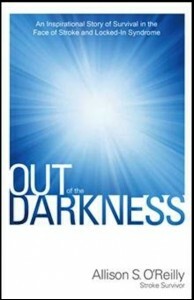 Out of the Darkness is my first-hand experience of a brain stem stroke resulting in a Locked-In Syndrome. This book chronicles the events of my massive stroke, as well as my will and determination to fight for my life and independence. This is the story of a miraculous recovery in the face of enormous odds, the task of relearning everything, the overwhelming challenges, and the lessons I learned about myself when faced with adversity. My positive attitude and being goal-oriented also played a big role. The word “stroke” is scary, but not knowing is worse. 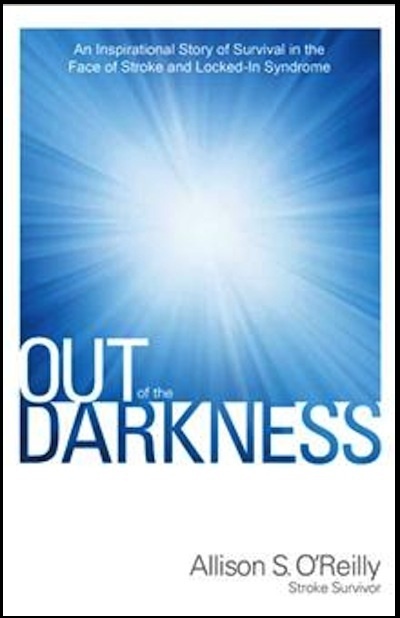 Reading Out of the Darkness gives a stroke survivor’s account and it gives the reader a glimpse into the mindset of the person going through the trauma.